As you start to need a painting project done you may not know where to turn in your community for local house painters that will do a great job for you. You can ask friends and family, and maybe your neighbors might even know somebody. I feel the best place you will ever find local house painters is the internet. First as you start you search you may want to type in the specific type of painting you are wanting done and included your area’s city in the search. If you are just searching for local house painters to do some interior painting in Jacksonville you may want to type in your search box interior painting Jacksonville. If you are looking for cabinet painting you could type in Jacksonville cabinet painting or Jacksonville cabinet painters. This is the basis for a good search. You may even want to search the service you desire with a couple different word arrangement as you will get different and maybe even better options that way. Online search for local house painters also will normally give you access to there reputation. An online reputation is pretty just. Some people pay for reviews or have friends and family leave them but if they do bad work someone is sure to leave them a bad review as people like to vent about bad service! And for good reason. I know as you look around you will get some options for your project. I here the normal way to do it is to get at least three quotes. I think this is a good idea, but maybe even up to 5 would be good so you take a better sampling from the market. 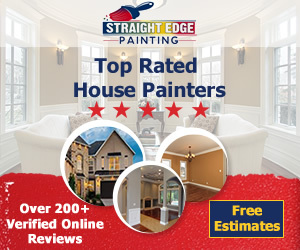 As you are searching for local house painters in Jacksonville we sure hope you come check out straight edge painting.